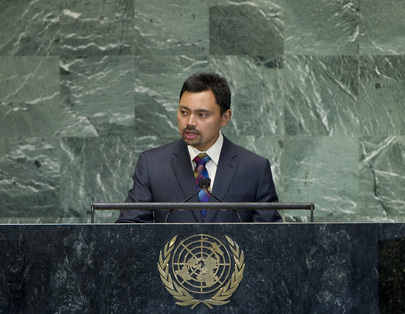 HAJI AL-MUHTADEE BILLAH, Crown Prince of Brunei Darussalam, said that at its core, the Secretary-General’s five-year vision for the work of the United Nations was about tolerance, respect and understanding among nations. Sadly, over the past two weeks, the world had witnessed events that presented a conflicting vision. In observing them, his nation had unreservedly condemned their cause, but it had equally stressed Brunei’s absolute rejection of the violence and extremism that had been their result. He congratulated the Secretary-General on his statement regarding the matter and reaffirmed his country’s commitment to the universal values of tolerance and respect. Turning to the theme of this year’s general debate — “the adjustment or settlement of international disputes or situations by peaceful means” — he said the word “adjustment” had been well-chosen, as it suggested that such dispute settlement must be carried out carefully and gradually to ensure that it did not invite confrontation. The theme provided him with an opportunity to express both satisfaction and concern about the way in which the Organization was managing the process of globalization. “Are we satisfied with the way things are, or de we see a need for some ‘adjustment’?” he asked. Beneath all the headlines about the failures and setbacks, the United Nations was making enormous contributions to the welfare of future generations by helping countries leave nineteenth century colonialism and twentieth century nationalism behind and “adjust” to twenty-first century regionalism and, eventually, “globalism”. The Organization had before it difficult work to ensure sustainable development for all. In that regard, he was pleased to see that, in the wake of the United Nations Conference on Sustainable Development — known as Rio+20 — work was moving from theory towards many practical ideas and activities. He was also encouraged that the Secretary-General had reported significant progress on achievement of the Millennium Development Goals, including, among others, that the target of cutting in half the number of people living in extreme poverty had been reached ahead of time. In light of those and other achievements, it was clear that the work of the Organization did not need “adjustment”. Rather, he said, there was perhaps a need to adjust its structure. Indeed, the fact that it was a twentieth century structure attempting to address twenty-first century realities had often led the media to highlight “supposed defects, failures and setbacks”. He said that the weakness of the Organization’s structure was personified by the Palestinian peoples’ six decades of suffering and by “all other desperate situations in which the root causes of conflict and confrontation are still buried in the last century”. Simply put, that must change; in a globalized world, all nations were interdependent and equally responsible. Like many Member States, Brunei Darussalam believed that the current structure of the United Nations did not reflect that interdependence and mutual responsibility. “As such, it needs adjusting so that ancient political fault lines are repaired,” he said, expressing the hope that the Organization would increasingly operate on the basis of consensus, rather than compromise and confrontation. That was the principle that had been accepted by Association of Southeast Asian Nations (ASEAN) members, who focused on building a peaceful and mutually respectful community of nations, regardless of background, economic status or national concerns. ASEAN countries had chosen to “adjust” the regions’ earlier identity as one of the most unstable places on the planet. “In the same way, we hope the structure of the United Nations can be gradually and carefully adjusted,” he said.